A deliciously thick and creamy peanut butter cup shake packed with protein. 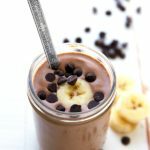 This chocolate + peanut butter flavored shake is healthy and good for you – perfect for a breakfast, snack, or a post work-out drink. Airports and airplanes are the worst for catching a cold or virus! I think every single time I’ve flown, I end up with something a few days later. And unfortunately, this travel was no different. Despite my best efforts to keep our hands clean and everything sanitized, both the babe and I ended up with a cold. When I’m sick, there’s nothing like burning hot soup or a freezing cold shake – both seriously help a sore throat! Also, I always think the healthier I can eat, the quicker I can beat the sickness. So I created this chocolate & peanut butter shake – one for me and one for the babe. And I ended up making another one shortly after since the babe wanted to eat both his and mine. He chugged this shake down! A few years ago when the husband and I lived in Boston, we were right next to a health food store – it was a 30-second walk from our apartment. When I went shopping there I was first introduced to chocolate soymilk and almondmilk. I’ve been a religious vanilla (or plain) almondmilk and soymilk drinker for years now. But the chocolate version was new to me. I still remember the first time I bought it – I practically finished the whole carton the same day! I’ve been hooked ever since. Anyways, it was back in this little apartment in Boston that I first created this peanut butter cup protein shake. I’ve been making it for a few years now so it’s about high time I share it with you! It all starts with some chocolate soymilk – one cup to be exact. 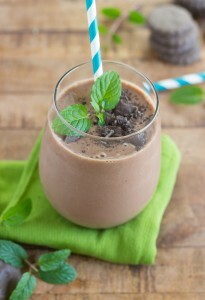 The soymilk and the chocolate protein powder are what creates the chocolate in the shake. 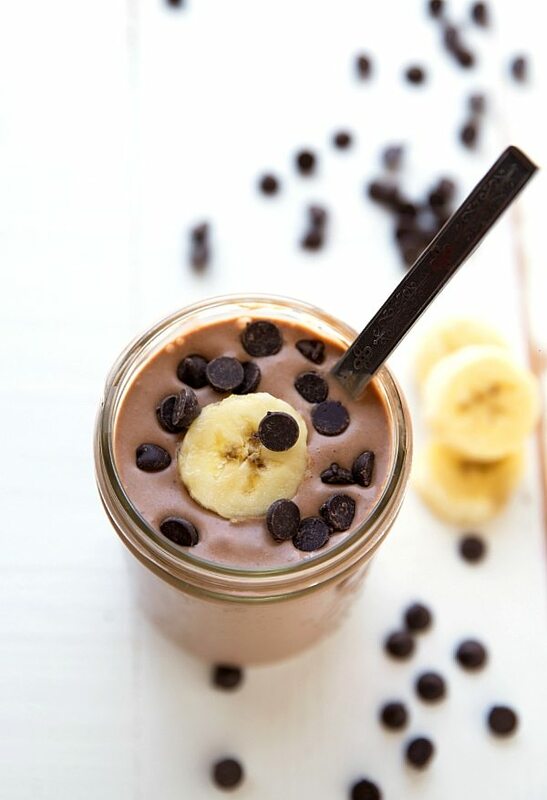 A frozen banana gives this shake a super amount of creaminess and the rest of the ingredients are pretty standard – little bit of sweetener, vanilla extract, peanut butter (of course), and some vanilla yogurt. 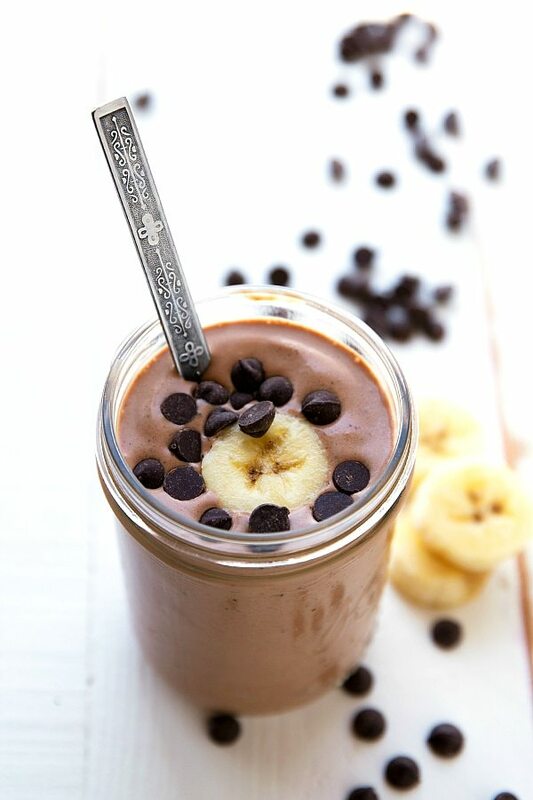 When the banana is completely frozen, combine it with the chocolate soymilk, vanilla or plain yogurt (Greek, low-fat, or regular), peanut butter, chocolate protein powder, truiva, and vanilla. Add ice if desired for a larger and thicker shake. Blend until smooth. Pour into a large glass and drizzle with extra peanut butter if desired. Yep. Don’t mind if I do. PB cups are my life….and so are protein shakes. I am obsessed with this. Pinned! 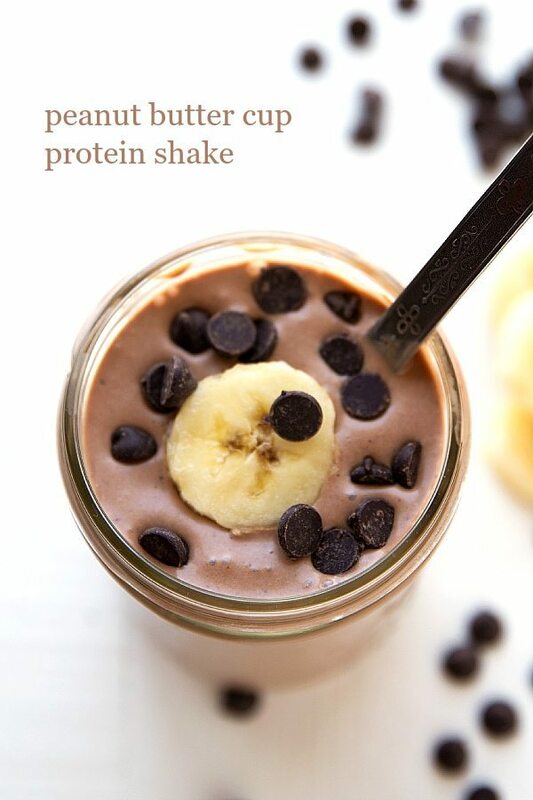 This protein shake looks so delicious, Chelsea! Your photos are flawless and I just want to dive into this beauty right now! 🙂 Pinning! This looks really yummy! I love peanut butter shakes. When I worked at Wendy’s I didn’t get sick even once because I washed my hands multiple times a day. So sorry to hear you guys got sick Chelsea! Ugh! Colds are the worst. 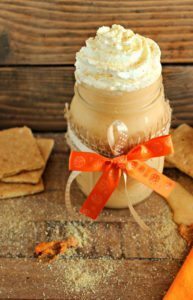 I have to tell you though – if I was sick, I could see how this Peanut Butter shake would be the perfect remedy – it looks absolutely amazing! I know what you mean about airports and flying, we seem to always catch something after traveling! Now I have a go-to recipe for when we get sick! Hope you get to feeling better soon! Love the shakes! Looks like a perfect way to kick start the day. I love my chocolate peanut butter banana smoothie. It’s my go to breakfast for the last 2 years. Have a great holiday weekend Chelsea! I hope you’re feeling better!! This shake is the BEST, and you’re right cold or hot are perfect when you’re sick. Pinned! This looks so delicious! I love anything chocolate and PB 😉 hope you are feeling better, it’s awful being sick… have a great weekend Chelsea! Aaw, sorry to hear you guys got sick Chelsea 🙁 Hope this shake helps you both feel better soon! It looks and sounds amazing! Pinning! Oh my goodness. This is going to be my post-workout shake. Healthy and full of protein (I’ll prob. sub greek yogurt for the regular yogurt. My boyfriend is sure to drink at least half of mine once he learns it taste like a peanut butter cup! Thanks for sharing! what is the calorie and fat intake do you know? Can’t wait to try this, my husband bought me a Ninja Blender for Christmas. I have 2 questions, What type of Chia Seeds do you use? and when you say Vanilla, Do you mean powder? Vanilla extract? Please advise. I don’t use a specific brand of chia seeds 🙂 Vanilla extract, sorry for the confusion! I hope you love this!